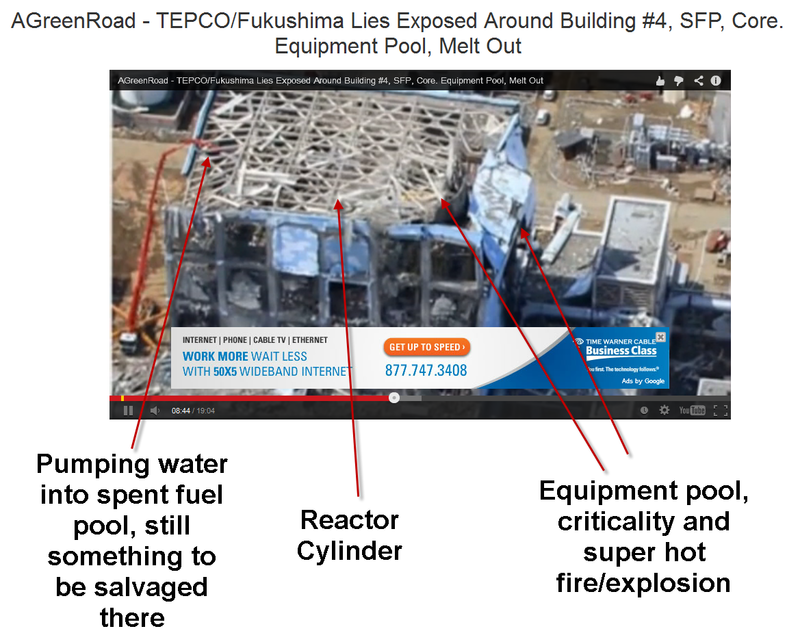 This link is a good compilation of pictures in Chronological order, the takeaway is that TEPCO lied yet again, and there was fuel in reactor 4, and the spent fuel pool melted/burned a little, and the equipment pool burned big time and burnt out of its pool and through the side wall of the building. Reactor 3 was already completely destroyed the prior day, so the claim that hydrogen explosion from the cross connector pipe to 3 went into 4 and caused the explosion is just ludicrous. Now we have to turn to thinking that 4 was also MOX, and also experienced a minor moderated prompt criticality. Reactor 4 was not empty, and the Equipment pool at 4 was full of MOX fuel. So this is a significant lie since that means so much more Plutonium was launched and aerosolized into our HOME PLANET atmosphere. Also because there was a meltdown of the hotter burning MOX, there was corium to concrete interaction, which results in much more Strontium being volatalized. This is backed up by Strontium being measured in higher quantities than Cesium in Hawaii cow milk. You probably do know that Strontium is way more deadly than cesium. I did a nice writeup here on Strontium. Watch the overwhelming proof in this material, that suggests TEPCO and the nuclear industry are lying about many of the things that happened with Building # 4. This is a report about the equipment pool of R4 totally melting down, and the fuel inside of it flowing out of the building. Satellite imagery of Fukushima all four reactors from March 14, 2011 @11:04am note R4 is steaming away! TEPCO and NRC claims r4 blew from hydrogen entering from reactor 3 pipe. How could this be possible when R3 is blown up and we can clearly see R4 undergoing extreme heat steam release? Satellite imagery from March 14, 2011 @11:04am R1 blown up melted down bottom left next up is the R2 building outside structure intact, next R3 MOX plutonium reactor blown up steaming heavily to atmosphere centre pic, top is R4 steaming away putting into question the lie from the nuclear industry that R4 blew up from hydrogen from R3. March 14 2011 @ 11:01am R3 building explodes, injuring six workers. @13:15pm The reactor core isolation cooling system for reactor 2 stops and, shortly afterwards, the water level within the reactor starts falling. @15:00pm A major part of the fuel in R3 meltsdown and drops to the bottom of the reactor pressure vessel. @18:00pm: The water level in R2 reaches the top of the fuel and by 20:00pm Core damage starts occurring in R2. Satellite imagery from March 16, 2011 @09:35am see R4 to the left (south) steaming from the south wall where the sfp (spent fuel pool) is located. R3 is steaming like a jet into the atmosphere centre pic most damaged reactor. Can see R1 on the right blown up and no steam as it would have already burned and released its lethal load to the environment. Satellite imagery March 16, 2011 @ 10:35am Just like the picture before this one we can see R1 in red box at top (north) with no steam from its already melted fuel. R4 is at the bottom (south) in red box no steam seen from the north wall. March 16, 2011 Zoom on North wall of R4 molten mass note the molten mass that flowed out of the wall is gold colour it later turns black as pictures will show. Also not the black smoke rising from R4! Satellite imagery March 17, 2011 @ 12:00am steam from all reactors dissipates compared to the first week of releases. March 18, 2011 fly over. Yellow smoke seen rising up from R4SFP indicating fuel damage in the SFP! March 18, 2011 fly over Zoom of molten mass that flowed out of R4 north wall the same side as the Equipment Pool (EP). The R4SFP in located on the south wall. March 20, 2011 drone fly over facing west, see r4 north wall buckled and blob melted out. March 20, 2011 drone fly over looking straight down see the buckle in the north wall. SFP is still steaming away good thing that means there is water. March 20,2011 heat signature from thermographic images show there was more to reactor 4 then the spent fuel pool. The SFP would be on the left and the core in the muddle and the equipment pool on the right all show heat signatures.